Warning! This article contains spoilers for Neverwinter’s latest expansion, Storm King’s Thunder! If you want to discover the story on your own, play through that first! The war with the frost giants over the Ring of Winter continues! When last we left our heroes in Storm King’s Thunder, the hunt for the stolen Ring of Winter led them from the frozen city of Bryn Shander to the frost-covered trees of Lonelywood and the harsh wilderness and bleak shores of Cold Run. While headway was been made tracking down the stolen ring, it was not without consequences. Makos, tiefling wizard and beloved hero of Neverwinter, perished at the hands of the frost giants of Fangbreaker Island. His death was mourned, but his sacrifice strengthened the resolve of our heroes to recover the ring and end the war with the frost giants once and for all. Now, the heroes’ quest leads them to the Sea of Moving Ice. Somewhere among the chilling waters and floating icebergs the frost giants have taken the Ring of Winter, preparing it to unleash an eternal winter upon the world. Artus Cimber, former keeper of the ring, still feels its pull and is certain the frost giant Jarl Storvald keeps it in his stronghold of Svardborg. Even the combined might of the heroes of Neverwinter and the Companions of the Hall may not be enough to take this icy fortress. The barbarian hero Wulfgar has rallied his people of the Elk Tribe to help battle the frost giants. But the local Ice Hunters have been enslaved by the frost giant forces and are harrying the heroes’ efforts at every turn. 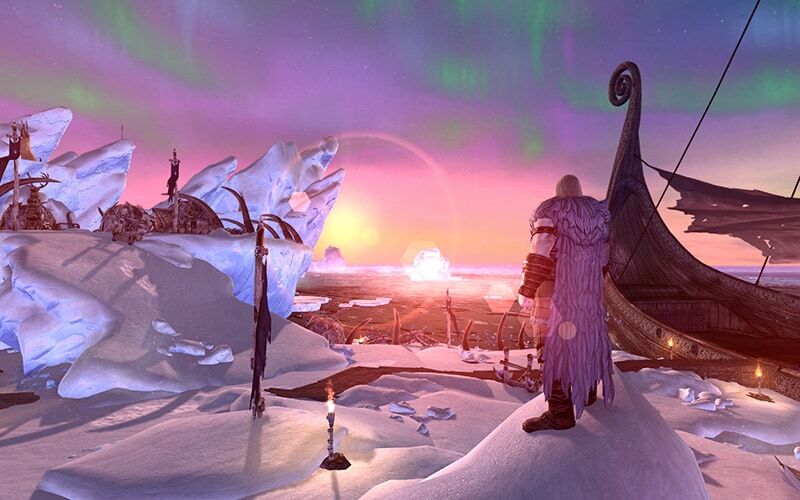 Will you dare the frigid waters to help end the threat of the frost giants? Be sure to check out the epic conclusion in Storm King’s Thunder: Sea of Moving Ice coming January 17 to PlayStation®4 and Xbox One!